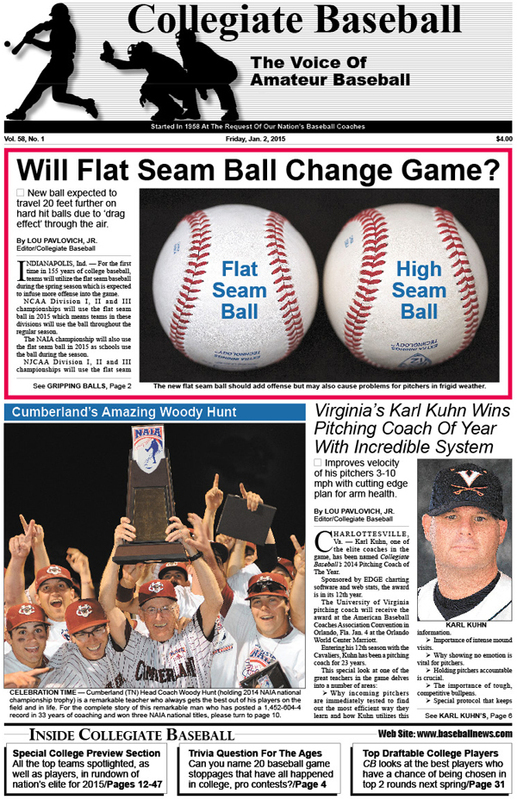 Special Report: Will flat seam ball change college baseball? New ball should add offense but may also cause problems for pitchers in frigid weather. In-Depth Report: Collegiate Baseball delves into the amazing system of Virginia Pitching Coach Karl Kuhn, CB’s National Pitching Coach of The Year. Legendary Coach: Woody Hunt of Cumberland (TN) explains how he has guided his program to 1,452 wins in 33 years. NCAA Div. I Top 40 Poll: See who is ranked in this special rundown of the nation’s elite. Ultimate Trivia Question: Bill Berrier has witnessed 20 different ways his baseball games have been stopped. Video, Book Reviews: Jerry Weinstein comes out with 2 great DVDs on pitching, catching while Jim Darby writes a superb book on his marketing adventures. NCAA Div. I Conference Rundowns: All the top players listed, including projected Pitchers of Year and Players of Year along with how teams are projected to finish. Louisville Slugger Pre-Season All-Americans: Elite NCAA Div. I players are honored in this special rundown. 2015 Draft Preview: Top college baseball players are showcased in this special rundown of athletes who are likely to be chosen in first two rounds. NCAA Division II Top Players: Special list features pre-season All-Americans, Players To Watch and Newcomers To Watch in each region of the USA. Top 40 NCAA Div. II Poll: Pre-season rundown of each team in the top 25. Special Instructional Clinic: Justin Dehmer and Jon Fitzpatrick explain the R.A.K.E. System and how it can be used for efficient goal setting. NCAA Div. III Top Players: Elite players across USA named. NCAA Div. III Top 30 Poll: Special rundown on top 25 teams. NAIA’s Top 25 Poll: In-depth look at each of the top 16 teams. Top JC Players Featured: Elite junior college players across USA are named by position. California JC All-Americans: Special list put together by California Community College Baseball Coaches Assn. NJCAA Div. I Top 20 Poll: In-depth look at the top 10 teams. NJCAA Div. II Top 20 Poll: In-depth look at the top 5 teams. NJCAA Div. III Top 10 Poll: In-depth story of top 5 teams. California JC Top 32 Poll: In-depth story of top 5 teams in Southern California and top 5 in Northern California. Northwest JC Top 10 Poll: In-depth look at top 5 teams. Upcoming Clinics: Terrific instructional clinics scheduled across USA. Editorial: Amazing inventors in baseball are the best in sports. To order the Jan. 2, 2015 edition of Collegiate Baseball or subscribe, CLICK HERE.